Prototype: Siemens Dispolok GmbH class ES64 U2 general-purpose locomotive. Version for the "boxXpress" cooperative project in ocean harbor traffic. 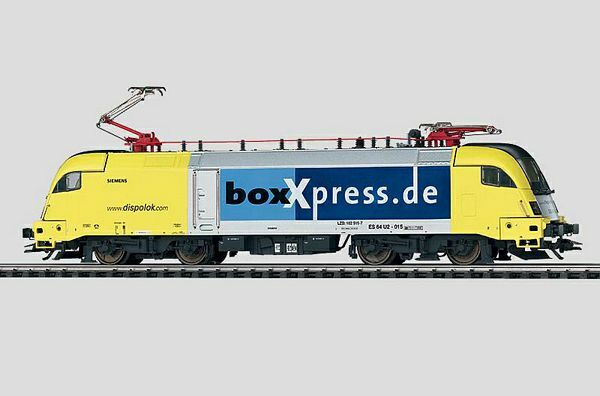 Model: Locomotive comes with a digital decoder and a controlled C-Sine high-efficiency propulsion system, light and sound functions. 2 axles powered. 4 traction tires. Headlights / marker lights are maintenance-free LED's. Headlights and marker lights will work in conventional operation and can be controlled digitally. Long distance headlights, air horn sound effect as well as the acceleration and braking delay can be controlled digitally with the 6021 Control Unit. Engineer's cabs have interior details. Separately applied handrails. Separately applied pilots. The wheels on the locomotive have a representation of sound mufflers. Length over the buffers 22.5 cm / 8-7/8.